University fielded one of the first ever Australian Football sides in 1859 and had a number of attempts at entering senior ranks in the 19th century (VFA 1885 to 1888, MJFA 1892), but it was 1905, when the University side entered the Metropolitan Junior Football Association for the second time that changed the direction of University football. 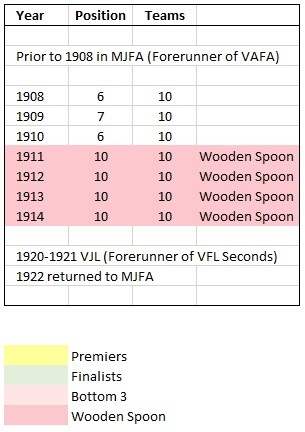 After immediate success in the MJFA, University joined the VFL in 1908, it continued to field a team in the MJFA, and fielded it's second tier team there. Rule changes to the VFL allowing player payments was passed soon after the clubs promotion and the club could no longer compete and maintain its amateur code. University's last year in the VFL was 1914. After WW1 University 'A' was part of the newly organised Victorian Juniour League (Later to become the VFL Seconds Competition). The first season of this new competition actually included both University teams as Caulfield (to be aligned with Melbourne) moved to a different competition, and their place was filled by University 'B' (the MJFA now called the MAFA did not restart in 1919). In 1920 University 'B' returned to the MAFA and in 1921 University 'A' followed them. With University fielding two teams in the MAFA, the identities shifted to University 'A'/Blues and University 'B'/Blacks, becoming equal teams rather than as A an B tier teams. Both teams have continued in the competition, called the VAFA since the 1930's. Note - Melbourne University also play intercollegiate football with a combined University team. Other University teams have also existed such as University Reds and a Womens team.